Correction: you lose the game if she enters the battlefield from your Command Zone. That's what Torpor Orb , Seer's Sundial and the counterspell cards are for. I'd advise getting Command Beacon for the deck and Deadly Allure needs to go because of the issue with Color Identity, but this setup looks pretty damn good despite that. 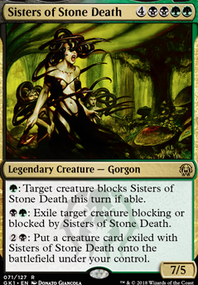 Deadly Allure isn't allowed, because the green flashback cost goes against Phage's Color Identity. A lovely deck, though, I must say! First strike/deathtouch is a great style for beginners- with the lifelinkers in there too it should do well in the current aggro meta. I'll cover a few basics, and explain how this informs my reccomendations for cards. 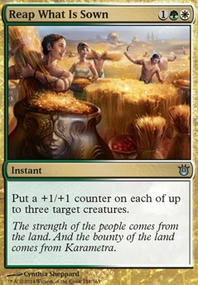 Competitive Modern is a turn 4 format- this means that games start ending at turn 4, and most 'game deciding' moments happen turns 2-6. This means that the most important spells are all cast on very little mana, and tend to have <3 cmc. As it stands, your curve isn't too bad. You're sitting around cmc3- but most of that is in creatures. Specifically, creatures that want to fight creatures, and some which gain life to try and stop you getting killed by a swarm of lighting bolts. They don't do things the moment they are played, like most 3 drops have to. Casting a Duress (or its big brother Inquisition of Kozilek) turn one makes games a lot simpler. Playing a 1 drop that trades with Tarmogoyf is amazing, be it Despise or Gnarlwood Dryad. The equpment are clunky and kinda awkward. They don't protect your creatures very well, and take 4ish mana to turn on. I'd take a look at artifacts that either give your creatures some resiliency for that cost, or provide card advantage. 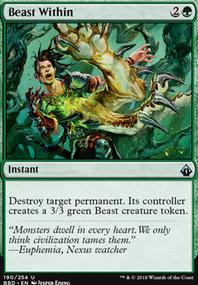 When you spend four mana, you need it to make an impact right away, because you are usually delaying yourself to cast it. Second, sideboard. A lot of the decks you will see don't really care about their creatures, be it KCI combo, Scapeshift or tron. If you include Duress and artifact hate (Deglamer or whatever), and some graveyard disruption (Tormod's Crypt if you can find nothing else, but Ravenous Trap and Nihil Spellbomb are there), it'll go well. Deadly Allure over Lure- its harder to disrupt and faster to use. Run a single Whip of Erebos in place of a longbow. More creatures getting used and more lifelink is good. It doesn't stack, but that isn't a huge issue. 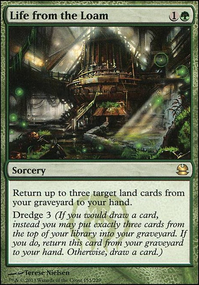 Something like Ghirapur Orrery, Phyrexian Arena or similar instead of Viridian Longbow- you're going to get more payoff drawing cards than sniping creatures (most of the time). If your opponent is drawing more cards than you and killing your creatures, drawing an equipment is rough. Viridian Claw is the most playable, but without Puresteel Paladin type shenanigans, equipment need to be a smaller part of the list. If you insist on big equipment then something like Lashwrithe Grappling Hook or Helm of the Host will soak up all your mana, but provide a bigger impact. For the smaller equipments- you aren't going to be reccuring them with glissa unless you sacrifice them. You can run some Salvage Slasher and Salvage Titan or something, but artifacts which sac themselves like Executioner's Capsule or Chromatic Sphere are the thing to go to there. Fountain of Renewal is worth a look- card advantage and anti-burn in one spell is ok. Mind Stone is a similar candidate. If you want to use Vengeful Pharaoh, include a discard outlet. The premium options are all over the site, but in this list something like Call the Bloodline will work- trading lands and dead cards for blockers and life is decent. It might also be worth looking at Molten-Tail Masticore- trading dead creatures for finishing a game is usually ok.
All told- your list is remarkably good, and will get a lot of laughs in casual play. The rest is seeing all the options out there and having fun tinkering to overcome your local meta to make it competitive. Already considered Treetop Village. 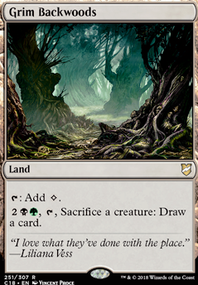 Added Hissing Quagmire as a dual colored land, in the first place. And as a "scare your opponent - sort of removal" thingy in the second. Maybe I skip man-lands for tempo. 26 creatures an token generation should be enough stuff on the board. Hello, I run a very similar list and would love to compare notes. The Deadly Allure is an interesting choice, I mostly just went for power cards. Innocent Blood isn't legal in Modern (too old) and Skullclamp is on the banlist (for good reason). Extirpate is a bad card in the maindeck, I would move that to the sideboard. Way too many decks barely care about cards in their graveyard and have no synergies worth breaking up. Deadly Allure isn't great either: It requires that the opponent a) has creatures, (control decks don't) b) cares about all of them (individual Lingering Souls aren't worth killing), c) hasn't tapped those creatures (Reality Smasher doesn't care). Tragic Slip might be the better choice, since you can easily trigger Morbid and it kills basically everything. Volvers are amazing, and my biggest MTG regret is that I wasn't around for Invasion block. I've looked back and seen what it had so many times, and every time I'm amazed at it. I've always wanted to see WotC print more cards that aren't strictly multicolored, but have abilities in different colors. I love Volvers, Battlemages of all sorts, cards like Deadly Allure, Embodiment of Spring, and Viashino Slaughtermaster. 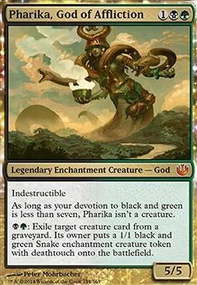 If we ever get Legendary Creatures with a layout akin to Volvers, Battlemages, etc (and I don't mean Tasigur, the Golden Fang and the like), then I may actually find myself really attracted to EDH.